The design of vernacular houses varies in character from region to region, adding distinctiveness to the landscape. In Shetland, houses are often set in parallel ranges with their farm buildings. Here the house (centre, right) has a byre in front of it, slightly down-slope. 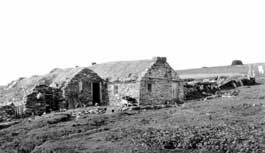 The thatch is held down by home-made ropes, from which stones are hung as weights. The walls are built from dry stone rubble.